If you're a man of style, don't wear a boring looking tuxedo jacket to that Prom or event you're going to. 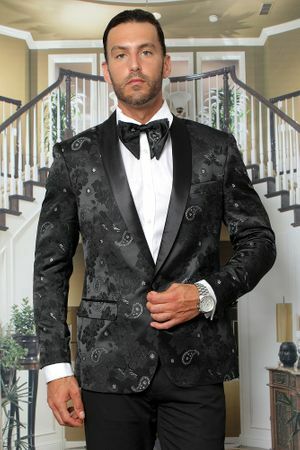 Do it the right way with a Manzini black paisley fitted tuxedo blazer. These stylish tuxedo blazers are what will set you apart from the crowd of boring dressed men. These fancy sport coats are anything but plain and boring. This Black paisley blazer has a modern fit that works every time and sequins to let you sparkle in the spot light like you're the MC on stage. Side vents in the back set it off right.